Search teams in Christchurch, New Zealand, have reacted with relief after finding no bodies in the rubble of the earthquake-hit cathedral. Cathedral Dean Peter Beck told Radio New Zealand that he "burst into tears" on hearing the news. 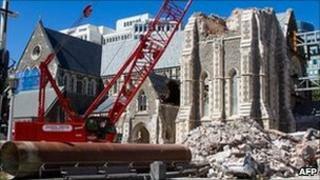 It was feared that as many as 22 people could have been inside the cathedral when the quake struck on 22 February. The confirmed death toll stands at 165 after two more bodies were found in the rubble of the Canterbury TV building. Christchurch's shattered cathedral with its broken spire became one of the most striking images after the 6.3 magnitude earthquake struck. "We have cleared the cathedral site and we found no bodies in the cathedral at all, so to us that is fantastic news," police Supt Sandra Manderson told Radio New Zealand. She said police were now reviewing the list of missing people and the death toll could be lower than first feared. Officials had said as many as 240 people could have lost their lives in the quake. "It will be really good if that does go down, and it's highly possible," Supt Manderson said. Dean Peter Beck said he heard the news from the head of the Urban Search and Rescue task force, Ralph Moore. "I was expecting to get a call from him saying they had found a body and I and my colleagues were going to go down and say prayers at the side of the body," he said. "But of course I got this other news and I just burst into tears. I was speechless, it was unbelievable." Earlier this week, police said 90 of the bodies found so far were pulled from the Canterbury TV Building. Rebuilding costs from the earthquake are put at billions of dollars. It is estimated that up to a third of Christchurch's inner city buildings have been, or will have to be, demolished.